WHAT WOULD SHAKESPEARE DO … ABOUT GLOBAL WARMING? December 2015 as the world leaders convene in Paris to discuss targets regarding global warming, one could be forgiven for thinking they were gathering to find ways to increase global warming. In fact global emissions of greenhouse gases have spiraled upwards out of control in the twenty one years since their first meeting on the subject. It is well beyond reasonable doubt that the fossil fuel corporations have consistently financed propaganda PR campaigns to deny, denigrate and destroy the peer reviewed and demonstrable science that the forces of predator capitalism are actively and knowingly, propelling the habitable earth as we know it beyond the brink of sustainability. In such a climate, we might ask What would Shakespeare Do? Write a play about it? Perhaps? The Liberty Bell Drama Company (Danbert Nobacon and his High School Drama students) did just that. 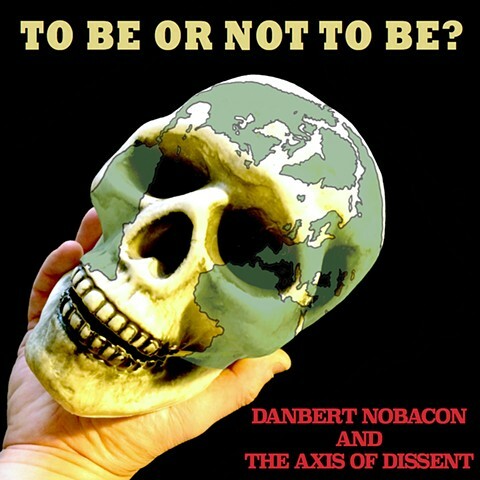 To Be or Not To Be? grew out of a half-snippet of a song from that play, Brain Circus NY 2025 which saw its world premiere in at The Merc Playhouse in Twisp WA, in May 2015. The other song on this record, Chemistry featured in the play Mirificus High which was the inaugural play by The Liberty Bell Drama Company, likewise premiering in Twisp, in April 2014. As students Holly Brielle and Bryn Clayton Jones were actors and active participants in the creation of both plays. The fabulous musicians on this record are from amongst Seattle and Twisp’s punk-as-folk finest, hailing variously from The Bad Things, The Mongrel Jews and The Pickpocket Review. Danbert Nobacon, (as a teenager himself in 1982) was a founder member of the English punk band Chumbawamba, and now, as an elder of the sapiens tribe, works with high school teenagers in North Central WA, creating theatrical and musical works.